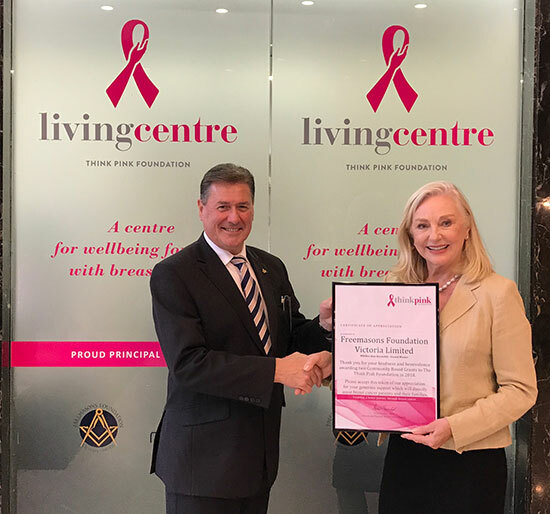 Presentation of a Certificate of Appreciation to MWBro Don Reynolds, Grand Master of Freemasons Victoria and Freemasons Foundation Victoria Limited from Irene Hendel OAM, Founder and Patron of the Think Pink Foundation. The Think Pink Foundation Supporting Blokes Program has received a major boost with a $36,950 grant from Freemasons Foundation Victoria Limited. 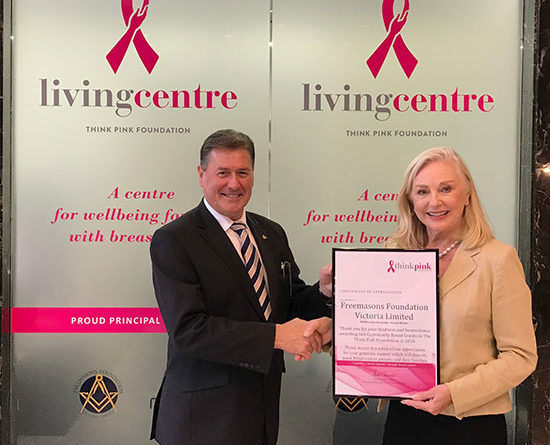 “Freemasons Victoria through Freemasons Foundation Victoria Limited has been a long term and significant supporter of the Think Pink Foundation for several years. “The Men’s Shed, with 27,000 members across Victoria and 329 Sheds, has become one of Victoria’s most important organisations providing both men and women the opportunity to establish social connections at local levels and to participate in wider community health and charitable programs across the State. Andrea Cannon, Think Pink’s Senior Breast Care Nurse said the new program aimed to extend the reach of the current Supporting Blokes Program based at the Living Centre in Melbourne which has been successfully operating over the last five years. The new rural-based program will develop a mutual-aid, peer support program and delivery network and will continue to operate through local health, community networks in the years to come. This unique program also supports men to develop positive strategies for lasting self-care and resilience.